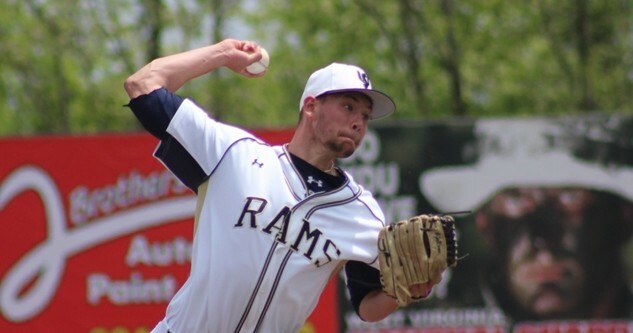 The Shepherd Rams baseball team (2-5) picked up its second win of the young 2018 season on Saturday afternoon, Feb. 24, with an 8-4 road victory in Petersburg, Virginia, over the Virginia State Trojans (6-1-1). With the win, the Rams have a two-game win streak heading into the double header Sunday against the Trojans. The Rams record sits at 2-5 after seven straight road games to start the year. The Rams will have to play an additional two more road games on Sunday afternoon before they get to host their first home game of the season on March 10 against Queens College, in what will be a double-header. Saturday’s road game started out rocky for the visiting Rams, with the team falling into an early two-run deficit by the conclusion of the bottom of the second inning thanks to runs scored by Trojans senior second baseman Jamar Hinton and sophomore left fielder Cecil Henderson that made the score 2-0 in favor of the Trojans. 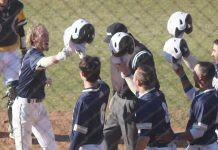 Shepherd came roaring back in the top of the fifth inning thanks to an RBI from Rams sophomore second basemen Eric Sloper, who drove in sophomore shortstop Trenton Burgeen on the play. Both teams went cold batting between the fifth and seventh innings with both pitchers catching their rhythm. No runs were scored until Shepherd broke through again in the top of the eighth inning on a two-run RBI from sophomore catcher Christian Hamel, bringing home junior right fielder Nick Atkinson and sophomore center fielder Brenton Doyle. The offensive explosion continued in the top of the eighth until the Trojans were able to stop the bleeding, but the Rams scored six runs in the inning to take a 7-2 lead. The Trojans were able to get across two runs in the bottom of the eighth to trim the Ram lead to 7-4 before the side was retired by freshman closer Adam Miller. Atkinson added the eighth run for the team, and his second of the game in the ninth inning off an RBI double to center field from junior first basemen Justin Smith. Smith led the Rams with three hits on five plate appearances to go along with his three RBIs and one run scored, an all-around performance in the win. As a team, the Rams registered 13 total hits and seven RBIs while only striking seven times as a team. 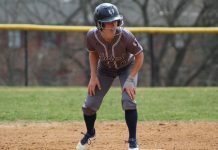 The Trojans were able to connect on the ball nine times but could not make as much out of it, stranding runners on base multiple times during the contest thanks in part to 10 team strikeouts. 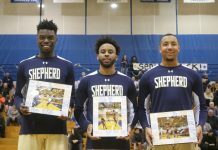 Shepherd looks to bring back a 4-5 record to Shepherdstown when the team hosts the first home game on March 10 against Queens College. To do this, the Rams must win both games of the double-header against the Trojans on Sunday afternoon against Virginia State University to complete the three-game series sweep. 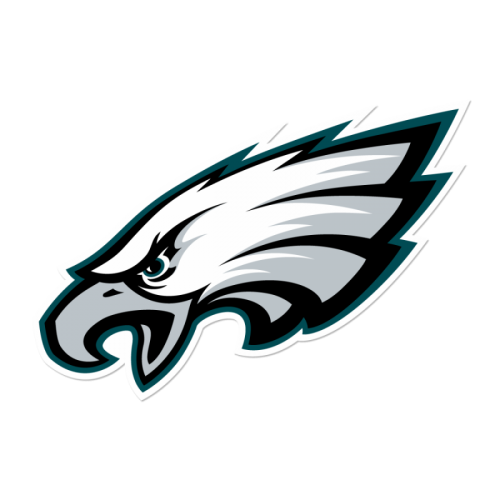 Sunday afternoon’s games start at 1 p.m. and 3:30 p.m.